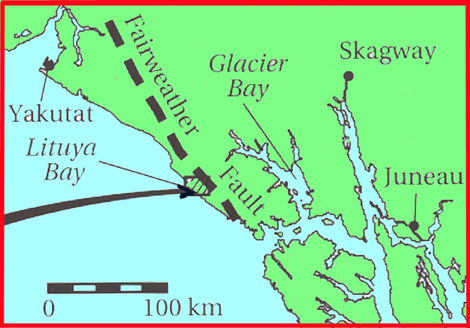 On July 9, 1958, a large earthquake along the Fairweather Fault struck Southeastern Alaska. A combination of disturbances triggered by the earthquake generated a mega-tsunami wave that rose to a maximum height of 1,720 feet (516 m) at the head of Lituya Bay. The extreme height of the wave and the mechanism of its generation were puzzling. There were questions as to whether there was sufficient water volume in the inlet at the head of the Bay for such an extreme wave to be generated and to reach such an enormous height. Several mechanisms for the extreme wave generation were proposed but none could be supported conclusively by the data on hand at the time. Suggested scenarios for the "mega-tsunami" included a combination of tectonic movements associated with the earthquake, collapse of a tidal glacier front, the possible sudden drainage of a subglacial lake on the Lituya Glacier and the major subaerial rockfall that occurred in Gilbert Inlet, immediately after the earthquake. U.S.G.S. 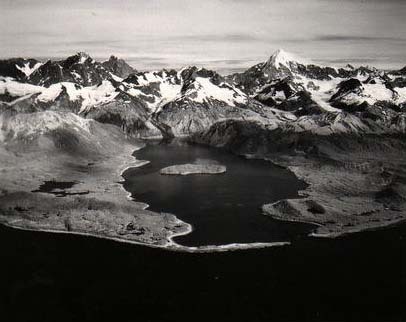 Aerial photo of Lituya Bay taken after July 9, 1958 event (U.S.G.S. photo). The subaerial rockfall was considered as the most significant contributor to the mega-tsunami wave generation. However, a simple mechanism of mass collapse of a portion of the mountain and water volume displacement could not account for the extreme wave height. The present study of all postulated mechanisms of mega-tsunami generation in Lituya Bay was undertaken to determine which was the main mechanism that really contibuted to the generation of the extreme wave. The following account provides some of the background material related to the tectonic setting and seismicity of the region, the chronology of events that followed the earthquake of July 9, 1958 , and the author's conclusion and explanation of a rockfal mechanism (the P.C. model) which can account for the observed mega-tsunami wave height, even if there was a water volume limitation. This P.C model hypothesis was subsequently accepted as being the correct mechanism of the mega-tsunami gneration and was verified with numerical modeling studies conducted by scientists at the Los Alamos National Laboratory (using the non-linear shallow water code known as "SWAN" - which included Coriolis and frictional effects, and subsequently with the Navier-Stokes, Eulerian compressible hydrodynamic code known as "SAGE" - which included the effects of gravity). The PC model hypothesis was further verified with physical modeling experiments (using a scaled rectangular prismatic water wave channel model) conducted by scientists at the Swiss Federal Institute of Technology (ETH) in Switzerland. Almost immediately after the earthquake and the giant rockfall of July 9, 1958 at the head of Lituya Bay, a massive mega-tsunami wave splashed to a maximum height of 1,720 feet on the southeast spur of Gilbert Inlet. The wave spread across the rest of the Lituya Bay wiping everything in its path on either side, over an area of about 4 square miles (10.4 sq. kms). At the time, there were three fishing boats anchored near the entrance of the bay. One of these boats sunk and the two people on board lost their lives. The other two boats were able to ride the wave. Among the survivors were William A. Swanson and Howard G. Ulrich, who later provided accounts of their observations. 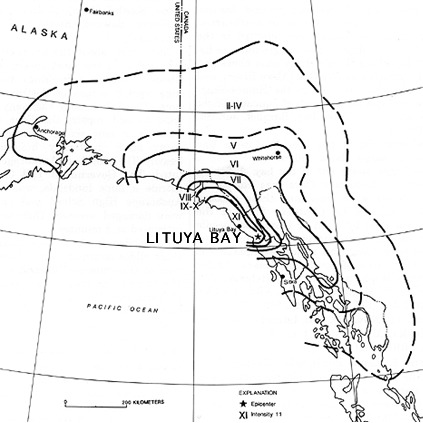 Miller (1960) documented in great detail all accounts, measurements, and observations related to the giant waves in Lituya Bay in a comprehensive report published by the U.S. Geological Survey. 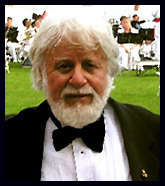 Captain Elliot B. Roberts, of what was then the U.S. Coast and Geodetic Survey, conducted extensive photogrammetric surveys and provided a good account of the event in the Smithsonian Institution Annual Report for 1960. The giant wave stripped completely all trees and vegetation in the Gilbert Inlet area to a maximum elevation of 1,720 feet (U.S.G.S photos). Another view of Lituya Bay from the head of the Bay looking outwards showing the effects of the giant waves (University of California - Berkley photo). Lituya Bay, is a T-Shaped bay, 7 miles long and up to 2 miles wide. The two arms at the head of the bay, are the Gilbert and Crillon Inlets, which are part of a trench along the Fairweather Fault. Cenotaph Island is in the central part of the bay. 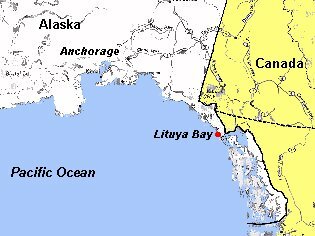 Lituya Bay was valley in northeast Alaska that was carved by glaciers. It became a bay when the glaciers begun retreating about ten thousand years ago at the start of the Wisconsin interglacial period. The Lituya and North Crillon glaciers, each about 12 miles long and 1 mile wide, have their origin near the crest of the Fairweather mountains at elevations of 4,000 feet or more. The Gilbert and the Crillon Inlets were formed by the retreat of these glaciers and have given the upper part of Lituya Bay its present T-shaped configuration. The inlets and the main body of the bay have U-shaped floors, underlain by recent terminal moraine deposits as well as from deposits of previous glaciations of the Tertiary period. Around the head of the bay the walls are steep - resembling the walls of fiords - and rise to elevations ranging from 2,200 to 3,400 feet in the foothills immediately to the north and south, and to more than 6,000 feet in the Fairweather Range, less than two miles from the shores of Crillon Inlet. The main part of Lituya Bay is 7 miles long and its width varies from three-fourths of a mile to two miles. Cenotaph Island divides the central part of the Bay into two channels which are two-fifths and four-fifths of a mile in width, respectively. The shores around the main part of the Bay are mainly rocky beaches. The adjoining areas rise steeply away from these beaches. At the entrance of the bay there is a long spit, La Chaussee Spit, which is the remnant of an arcuate terminal moraine from the last period of glaciation. The tectonic setting of the region is controled by the interaction of the Pacific and the North American tectonic plates. The great plates move in complex, irregular patterns resulting in earthquakes with faulting that differs along their boundaries. To the south, in the vicinity of California, the boundary is marked primarily by a large transform fault system which is the San Andreas and the numerous secondary faults. The San Andreas fault is also the boundary between the Mendocino fault separating the Gorda and the Pacific plates. Immediately north of this area is the Cascadia subduction zone which marks the boundary between the Gorda and the Juan de Fuca plates offshore and the North American plate. The Gorda plate is the block being subducted beneath the North American plate. However, a thrust fault of this type slopes gently relative to the earth's surface. Earthquakes along such a thrust fault push the rock above the ramp up and over the rock beneath it. In very active subduction zones such as Cascadia, the boundary between the plates resembles a giant thrust fault, which usually extends for hundreds of miles in length. The locked part of the subduction interface is known as the megathrust. All of the world's greatest earthquakes (with moment magnitude of 8.5 and larger) which have produced Pacific-wide tsunamis in the past, were associated with ruptures of megathrusts along steeper angles. Further north along the west coast of Canada and Alaska, the Queen Charlotte and Fairweather faults are part of a long fault system that mark the eastern boundary of the Pacific plate and the western boundary of the North American plate. In this region, the Pacific plate moves in a northwestward direction relative to the North American plate, thus creating a large transform boundary, characterized mainly by the two plates moving horizontally but in opposite directions. Most of the earthquakes along these faults are strike-slip events and do not generate tsunamis. The Fairweather fault in Southeastern Alaska marks one of these boundaries. The Fairweather fault, is at the northern end of the Queen Charlotte-Fairweather fault system. It is is a strike-slip fault with right lateral movements. It extends for about 280 kilometers from Cross Sound in a northwest direction to its junction with the St. Elias fault in the vicinity of Yakutat Bay in Alaska. The fault is a recognizable geomorphic feature with a surface trace of 200 kilometers from Palma Bay on the southeast and as far northwest as Nunatak Fiord east of Yakutat Bay (Tocher, 1959). 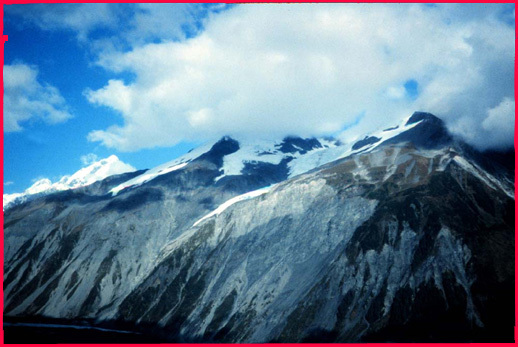 The large earthquake of July 9, 1958, occured along the Fairweather Fault in Southeastern Alaska. In the vicinity of Lituya Bay, the Fairweather is a transform fault but with substantial vertical movement of the oceanic crustal block upward. The great 1899 earthquake on the Fairweather, also caused some dramatic vertical changes. Both the Crillon and Gilbert inlets at the head of Lituya Bay, and their extensions covered by glaciers on either side for a total distance of 12 miles, have been formed by trenching action along the Fairweather fault. The inlets themselves and the entire Bay are part of the oceanic plate, which actually rose by about 3.5 feet in this particular area, as a result of the July 9, 1958, earthquake. The fault line traverses the entire head of the Bay on the northeastern side of the inlets. Isosmeismal map of the earthquake of July 9, 1958 showing distribution of intensities from which very strong ground motions can be inferred for Lituya Bay (Modified map of the U.S. Geological Survey). The quakes The quake epicenter was at latitude 58.6'N., longitude 137.1`W., at a point near the Fairweather Range about 7.5 miles (12 km) east o the surface trace of the Fairweather fault and 13 miles (20.8 km) southeast of the head of Lituya Bay. The earthquake had a magnitude of 7.9, on the Richter Scale, although some sources have reported it to be as much as 8.3. (Brazee & Cloud, 1960). This was the strongest earthquake in the region since the September 4, 1899, 8.2 magnitude, Cape Yakataga earthquake. The shock was felt at all cities in southeastern Alaska over an area of 400,000 square miles, as far south as Seattle in the state of Washington, and as far eastward as Whitchorse, Y.T., Canada. Ground displacements of 3.5 feet (1.05 m) upward and 21 feet (6.3 m) in the horizontal plane were measured on surface breaks along the Fairweather fault 6 to 10 miles southeast of Lituya Bay's Crillon Inlet (Tocher and Miller, 1959). It is presumed that similar displacements occurred along the Crillon and Gilbert inlets at the head of Lituya Bay where the mega-tsunami was generated. Little is known about the ground motions in the immediate area at the head of the Bay. There were no strong motion recordings of this event. However, because of the proximity of the upper Lituya Bay to the epicenter and because of the geometric orientation with the Fairweather fault, the surface waves and the strong ground motions begun almost immediately after the onset of the earthquake. For an earthquake of this magnitude, it would be expected that the strong ground motions lasted anywhere from 40-60 seconds or even 90 seconds, perhaps with some interruption, but probably peaking at about 20-25 seconds after the beginning of the quake. The earthquake of July 9, 1958 in Lituya Bay was associated with ground motions of high intensity which resulted in very high ground accelerations near the head of the Bay. Eyewitness accounts confirm it. Survivor Swanson situated on a boat anchored near La Chaussee Spit close to the bay entrance, reported seeing the whole Lituya Glacier moving up and down. This may have been an optical illusion as the Lituya Glacier was out of his line of sight. However what he probably observed could have been happening on the other side of Gilbert inlet where a giant rockfall was triggered, or could have been ice going over the spur on the southwest wall of the inlet when the 1,720 foot water splash occurred. An isosmeismal map of the U.S. Geological Survey indicates a distribution of high earthquake intensities from which we can infer very strong ground motions during the earthquake. Maximum intensity of XI was reported in the main part of the Bay, although closer to the fault, at the head of the Bay, an intensity of XII is very possible. Earthquake ground motions of such high intensity (XI, XII on the Modified Mercalli scale) could have resulted in vertical accelerations of up to 0.75g and horizontal accelerations of as much as 1.0g. Such ground accelerations would have caused the movement of ice observed by Swanson. In the absence of adequate data for the Lituya Bay event to support these assumptions, analogies can be drawn from recorded recent large earthquakes elsewhere. For example, high horizontal and vertical accelerations were associated with the 17 January 1994, Northridge earthquake in California. This earthquake, although of moderate 6.7 magnitude, produced vertical accelerations of as much as .75 g, horizontal accelerations of up to 2.0 g. and caused extreme and unexpected damage in San Fernando Valley. The Northridge earthquake occurred along the White Wolf fault in the Transverse Ranges north of Los Angeles which, in contrast to other segments of the San Andreas fault system, is characterized primarily by transform faulting, similar to what occurs along the Fairweather fault. 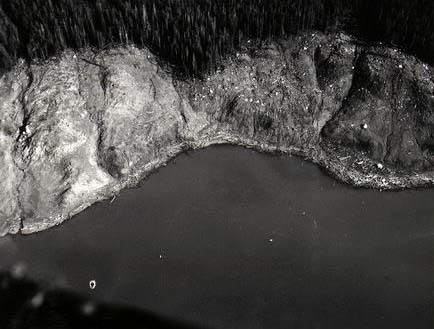 A displacement in which the southwest side moved relatively northwest 21 1/2 feet and up 3 1/2 feet was measured at one point on the fault just east of the north end of Crillon Lake (Tocher, 1959). A wide variety of geological effects, other than faulting, were observed throughout a broad area along the Pacific coast from Cape Spencer to Mount St. Elias. Among these were earth and rock avalanches, snow and ice avalanches, earth slumps, and a variety of other secondary phenomena. There have been three other significant earthquakes along the the Queen Charlotte-Fairweather fault system in the 20th Cenury. In 1927 an earthquake with magnitude 7.1 (Ms - surface wave magnitude) occurred in the northern part of Chichagof Island. Another earthquake in 1949 near the Queen Charlotte Islands had magnitude 8.1 (Mw - moment magnitude). A third earthquake in 1972 near Sitka had a magnitude 7.4 (Ms). Giant waves have repeatedly occurred in Lituya Bay in the past (Miller, 1954). Ship logs of the famous French Explorer LaPerouse (who is credited with the discovey of the Bay in 1786) commented on the lack of trees and vegetation on the sides of the bay, "as though everything had been cut cleanly like with a razor blade". Other early explorers had also commented on successive lines of cut trees, indicative of other past large landslides and inundations. It has been estimated that five other giant waves occurred in Lituya Bay during a 150 year period. Indian legends about a possible giant wave in 1853 or 1854 have not been confirmed. However there is dendrological evidence on old trees and an dated 1854 trimline that support such an occurrence. Photographs of trimlines taken from 1894 to 1929 show that at least one and possibly two waves occurred between 1854 and 1916. These trimlines were largely destroyed by the 1936 wave and were entirely gone after the 1958 wave. 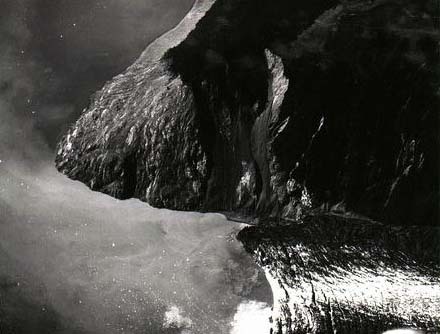 The last giant wave in Lituya Bay before 1958 occurred on October 27, 1936. This event is not believed to have been associated with an earthquake (Miller, 1960). Its mechanism of generation remains unknown. It could have been caused by a rockfall or a landslide. The 1936 wave uprooted out trees to a maximum elevation of 150 meters. Because of the unique geologic and tectonic conditions of Lituya Bay, such giant waves will undoubtedly occur again in the future. The source mechanism of the 1958 mega-tsunami in Lituya Bay has been shrouded in mystery. The present analysis was undertaken for the purpose of examining all of the proposed mechanisms, in order to determine the most likely scenario that could account for the giant 1,720 foot wave runup at the head of Lituya Bay. Examination of the bathymetry of Lituya Bay was the first step in determining if the volume of water was sufficient to account for the 1720 ft. wave. Bathymetric surveys made in 1926 and 1940 (U.S. Coast and Geodetic Survey, 1942), show that the head of Lituya Bay is a pronounced U-shaped trench with steep walls and a broad, flat floor sloping gently downward from the head of the bay to a maximum depth of 720 feet (220 meters) just south of Cenotaph Island. From there, the slope rises toward the outer part of the Bay. At the entrance to the Bay, the minimum depth is only 33 feet (10 meters) at mean lower low water. 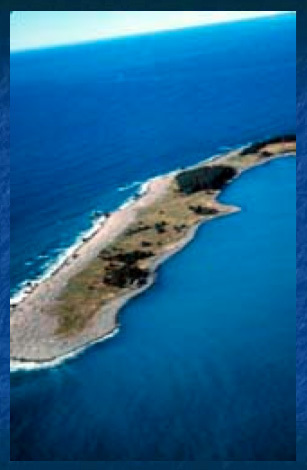 The outer portion of Lituya Bay is enclosed by La Chaussee Spit, with only a very narrow entrance of about 700-800 feet kept open by tidal currents. The tide in the bay is diurnal, with a mean range of 7 feet and a maximum range of about 15 feet (U.S. Coast and Geodetic Survey, 1957). The U-shape of the bay and the flatness of its floor indicate that extensive sedimentation has taken place, but the thickness of the sedimentary layers is not known. The thickness of the sediments at the Gilbert and Crillon inlets is not known either, but believed to be substantial due to terminal moraine deposition during different brief glacial and interglacial episodes. Eyewitness accounts and subsequent measurements support the following scenario of events. Beginning at about 10:16 p.m. on July 9, 1958, within 15-20 seconds following the onset of the earthquake, the southwest side and probably most of the bottom of Gilbert and Crillon Inlets begun to move northwestward and up relative to the northeast shore at the head of Lituya Bay, on the opposite side of the Fairweather fault. Because of the proximity to the epicenter and to the fault, the strong ground motions must have peaked within 25-30 seconds. Within 50 to 60 seconds, net tectonic displacements had pushed the entire inlet and its extensions along the Crillon and Lituya Glaciers by 3.5 feet upward and 21 feet in the horizontal plane, tilting the entire Bay in a seaward direction. These tectonic displacements are supported by observations of the surface breakage along the Fairweather fault 6 to 10 miles southeast of Crillon Inlet (Tocher and Miller, 1959). The intense shaking in Lituya Bay continued for at least 1 minute according to the account of Swanson, and possibly as much as 4 minutes according to Ulrich. However, it is doubtful that the earthquake shaking could have lasted as long as 4 minutes as Ulrich reported. During the first 50-60 seconds, the tectonic displacements, in combination with the stronger ground motions and high vertical and horizontal accelerations of surface seismic waves, weakened a large slab of rock on the precipitous northeast shore at the head of Lituya Bay. Both Ulrich's and Swanson's accounts, indicate almost certainly that the rockfall was triggered by the earthquake. According to eyewitness Ulrich, a deafening crash, resembling an explosion, was heard at the head of the bay approximately 2.5 minutes after the earthquake was first felt. He also reported that the wave definitely started in Gilbert Inlet, just before the end of the quake. According to him the water did not go up to the 1,720 foot elevation, but splashed to that elevation. However, the timing of the explosion sound and the appearance of the wave are somewhat inconsistent in his account. As it was indicated above, for an earthquake of that size, the ground motions would not have lasted more than 60-90 seconds. A wave would not have appeared before the explosion sound. 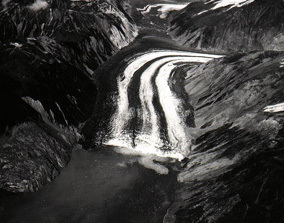 The other eyewitness, Bill Swanson, reported seeing the glacier riding high into sight from behind the western mountain, followed by a great wave of water washing over its steep face. It has been well documented in the scientific literature that waves with large energy content are generated impulsively by different mechanisms related to large earthquakes in regions of subduction, to volcanic and nuclear explosions, to landslides, and to large masses of water added suddenly to a body of water. To these we must also add the impulsive impacts from large rockfalls or from asteroids and comets falling on a body of water on earth. The characteristics of waves generated by such impulsive mechanisms will depend upon the disturbing force and the rate at which the force is applied. Resulting water waves may be oscillatory in character, nearly solitary in form, or as a complex non-linear wave existing entirely above the initial undisturbed water surface, or a bore (Prins, 1958a, 1958b). The giant 1958 wave that rose to a maximum of 1,720 feet at the head of of Lituya Bay and the subsequent huge wave along the main body the Bay, were caused by an impulsive event with a very large energy content. The mechanism that generated the giant wave runup of 1,720 feet above sea level has been a mystery that has baffled scientists. That such a giant wave is possible has been extensively doubted on theoretical grounds. Several mechanisms have been proposed, none of which can be conclusively supported by the data. The giant wave must have been generated by a combination of disturbances triggered by the large earthquake. Factors that contributed were the result of cumulative effects rather than those from a single source. Generative causes included a combination of tectonic movements associated with the earthquake, movements of a tidal glacier front, the possible sudden drainage of a subglacial lake on the Lituya Glacier, but primarily as this study concludes, by a major subaerial rockfall into Gilbert Inlet. In the following sections we shall review and comment on all such impulsive mechanisms. Landslides are not very effective mechanisms for tsunami generation. The energy imparted to the water body is about 4% of the total energy. No known landslide ever produced a wave that would approach the magnitude of the Lituya Bay event. The runup of 1,720 feet is more than 8 times the maximum height reached by the largest of the slide-generated waves in Norway. 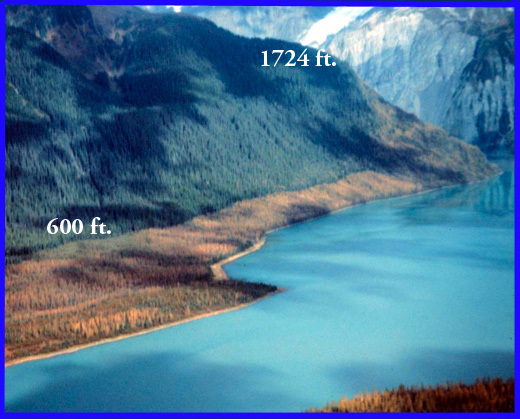 Simple displacement of water by material of an ordinary landslide cannot account for the 1,720 foot runup observed on the other side of Gilbert inlet. Subsequent modeling studies indicated that a simple landslide mechanism could not account for the huge wave. Similarly, fault displacement could not have been an important contributing mechanism to the generation of the giant wave that reached the 1,720 ft. elevation at the spur of Gilbert Bay. As indicated previously, the Fairweather fault line in the vicinity of Lituya Bay, lies near the northeast side of Gilbert and Crillon Inlets. The earthquake resulted in tectonic displacements which were primarily in the horizontal plane. There was an upward movement of 3.5 feet and a horizontal movement of 21 feet. Even if we assume that nearly the entire area under water at the head of Lituya bay moved relatively northwestward and up by 3.5 feet, such tectonic movement could not have displaced enough water to generate the extreme runup or the wave observed subsequently in the Bay. The wave motion resulting from such tectonic displacement should have been directed toward the northwest and southeast side of the bay and (or) toward the head of the bay. Vertical displacement of the bottom of the bay along the Fairweather fault would have generated waves as a line source across the entire head of the bay. However, according to eyewitnesses reports, this was not the case as there was a lapse ranging from 1 to 2.5 minutes between the onset of the earthquake and the first sighting of the wave at the head of the bay. Also, the eyewitness accounts and the subsequent observations indicated a wave source mechanism that resulted in a radial pattern of propagation from a point source in Gilbert Inlet. In conclusion, a tectonic mechanism alone could not have displaced sufficient volume of water to account for either the extreme runup at the head or the subsequent wave inundation in Lituya Bay. Also, the subsequent modeling studies confirmed this. A partly subglacial lake exists just northwest of the sharp bend in the Lituya Glacier at the head of Lituya Bay. Following the earthquake of July 9, 1958, an observation was made that the level of the lake had dropped by about 100 feet. Therefore a mechanism of sudden drainage of a large volume of water from this glacial lake was considered as the cause of the giant 1958 wave. However, such mechanism would also be unlikely for the following reasons. To hypothesize the great 1720 ft. runup from such mechanism, not only a great volume of water would needed to be ponded in a chamber at an elevation high enough to produce the necessary hydraulic head, but a strong impulsive triggering mechanism was also needed to cause its sudden drainage into Gilbert Inlet. 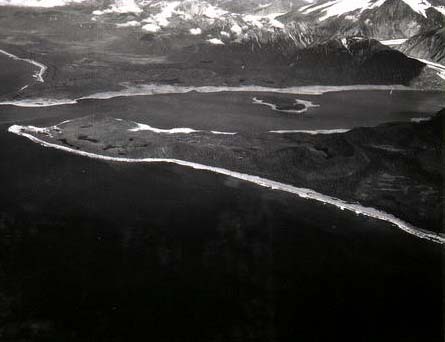 USGS photograph showing an aerial view of Gilbert Inlet taken after the earthquake of July 9, 1958, showing the Lituya Glacier, and the effect of the giant wave runup of 1720 feet at the southeastern spur in clearing all trees and vegetation. Certainly the earthquake displacements and ground motions were sufficient to perhaps trigger such an event. Therefore, the remaining questions are: a) was there enough water drained to cause the 1720 ft. wave? b) was the hydraulic head high enough and the rate of drainage sudden and fast enough to account for the large runup? c) did the water roll down the face of the glacier or was it suddenly released beneath the glacier or through an ice tunnel below sea level in the front of Gilbert inlet? and d) did subsequent wave inundation of the coast line in Gilbert and Crillon inlets as well as in the Lituya Bay validate such mechanism? In answer to these questions the following can be said. The hydraulic head was high enough. However, there was no physical evidence that sudden drainage of the lake on the surface of Lituya glacier itself occurred. Since the water level was 100 feet lower following the earthquake, it is quite possible that a fairly large volume of water drained from the glacial lake through some glacial tunnel and resulted in some sudden upwelling immediately in front of the glacier. It is believed that neither the volume of water nor the rate of drainage would have been sufficiently high to account for the 1,720 ft. wave or to justify the subsequent wave observed in the Bay. Finally, given that such drainage would have occurred in front of Gilbert Glacier, maximum runup would have been expected on the opposite side in Crillon inlet, rather than at the spur on the southwestern corner of Gilbert inlet. In view of these considerations, it can be concluded that sudden glacial drainage was not the mechanism that produced the extreme giant wave in Lituya Bay. There was not sufficient volume of water and the drainage was not sufficiently impulsive. The modeling studies also confirmed that this could not have been the mechanism of generation of the enormous wave. In the absence of adequate data, analogies were drawn from recorded recent large earthquakes elsewhere around the world and from rockfalls and landslides in fjords and other enclosed or semi-enclosed bodies of water for characteristics that could explain what triggered the giant rockfall and the extreme wave at the the head of Lituya Bay. Additionally, the tectonic setting of the Fairweather fault in this particular region was carefully examined. 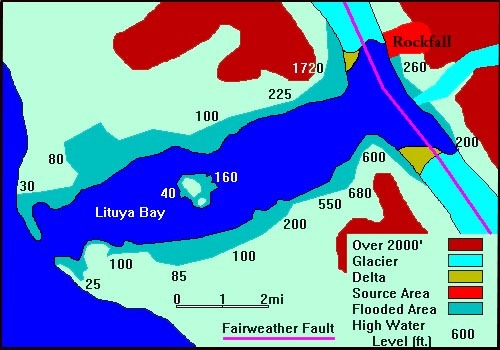 Indeed the upper Lituya Bay response and the associated secondary phenomena that contributed to the giant slushing wave action in Gilbert Inlet that day depended on the earthquake parameters, such as energy release, proximity to the epicenter, the physical rupture along the fault, the propagation path of the surface seismic waves, and the magnitude and duration of the dynamic, near-field, strong ground motions. However, even earthquake ground motions of high intensity with vertical accelerations of up to 0.75g and extreme horizontal accelerations of as much as 1.0g could not account for the generation of the giant wave. The giant rockfall at the head of the bay was considered to be the most likely culprit for the generation of the giant wave, but in the absence of sufficient water volume at the head of Lituya Bay, even this generative mechanism remained puzzling. However, the author proposed the following scenario which could account for the energy released to generate the huge wave and was not restricted by the existing volume of water in Gilbert Inlet. 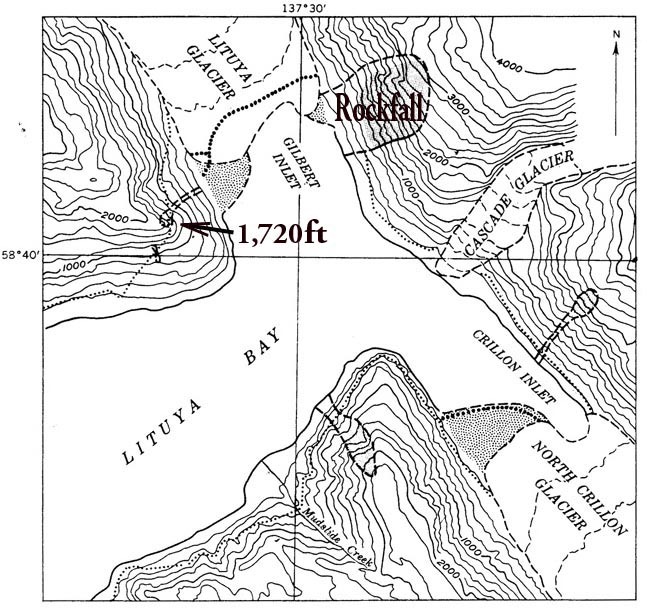 According to this scenario, the giant wave runup of 1,720 feet at the head of the Bay and the subsequent huge wave along the main body of Lituya Bay were caused primarily by the enormous subaerial rockfall into Gilbert Inlet. The triggering mechanism of this rockfall and the effects that it produced were significantly different from those of other subaerial or submarine landslides. This was not a gradual process as with a landslide, but a very sudden event. The giant rockfall was triggered impulsively. Thus, the term rockfall rather than rockslide or landslide, was used to distinguish this particular type of phenomenon and to explain the subsequent effects of its impulsive impact. In some respects, corrected for scale factors of mass, terminal velocity and angle of entry, the impact of this rockfall into Gilbert Inlet could be considered analogous to that of an asteroid falling on earth. To explain the impulsive mechanism of wave generation from such impact we must first examine the time history of events immediately following the onset of the earthquake and the intense ground motions and accelerations that triggered this rockfall. In spite of some uncertainty in the chronology of events, the following was the most pobable scenario: No less than 50-60 seconds and no more than 150 seconds after the earthquake begun, a large mass of rock material along the very steep mountain side on the northeast side of Gilbert Inlet at the head of Lituya Bay, on the other side of the Fairweather fault, cleaved and ruptured as a result of strong ground motions and mostly lateral movement. The giant rock mass had more than 40 million cubic yards of material and extended as high as 3,000 feet, with a center of gravity at about 2,000 feet above sea level. Driven by gravity force of almost 1g, this rock mass plunged practically as a monolithic unit into Gilbert Inlet at a very steep angle of perhaps as much as 75 degrees, as the sides of the Bay were truly precipitous The rockfall left a giant scar on the mountain. The impact of the large rockfall on the surface of the water was the explosion-like sound heard by Ulrich. Trapped air could have contributed to the explosive sound. The impact of this mass of rock, not only displaced with great force the water but struck the bottom of Gilbert inlet and created a large radial crater, displacing and folding an equivalent volume of recent glacial sediments and deeper semi consolidated Tertiary layers, to an arcual distance estimated to be least 800 feet out from the front of the precipitous shore. The sudden rockfall impact, the displaced water, and the folding of the bottom sediments, in combination with the dynamic ground motions, sheared 1,300 feet of ice from the entire Lituya Glacier front, leaving a vertical wall of ice almost normal to the trend of Gilbert inlet. Drainage of the glacial lake contributed to the loss in the frontal area of the Lituya glacier. 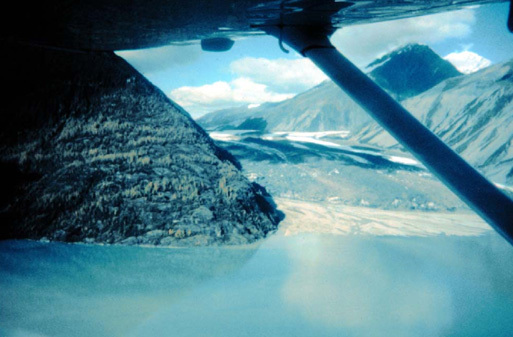 Also, the rockfall impact generated a non-linear wave existing entirely above the initial undisturbed water surface, which splashed as a sheet of water to the 1,720 foot elevation on the other side of Gilbert inlet, three times the water depth. The rockfall impact, with some contribution from the net vertical crustal uplift of about 3.5 feet, and from the overall tilting seaward of the entire crustal block on which Lituya Bay was situated, generated a solitary gravity wave. This huge wave originated in Gilbert inlet and propagated outward the head of the Bay where its height was estimated at 100 feet or even much greater by Ulrich. Because of its point origin and initial orientation the wave moved in a southerly direction striking first against the steep cliffs on the south side of the main bay in the vicinity of Mudslide Creek where maximum runup occurred. Then the wave reflected and refracted toward the north shore into the main portion of Lituya Bay, and again back to the south shore near the vicinity of Coal Creek. Time estimates by eyewitnesses Ulrich and Swanson of the time elapsed from the first sighting of the wave at the head of the bay until it reached their boats, indicate that the wave must have been traveling at an average speed ranging between 97 and 130 miles per hour, at least in the deeper portion of the bay south of Cenotaph Island. This was the most likely mechanism (the PC model) that could account for the giant wave (Pararas-Carayannis, 1999). The PC scenario of the impulsive rockfall mechanism, with crater creation and air bubble explosion can account for the giant wave of 1,720 feet at the head of Lituya Bay - even in the absence of sufficient volume of water at Gilbert and Crillon inlets. Subsequent mathematical, full Navier-Stokes modeling of mega-tsunami generation at the Los Alamos National Laboratory using the PC model parameters (Mader, 1999; Mader & and Gittings, 2002 ) supported this mechanism and further illustrated that there was sufficient volume of water to account for the giant wave runup. 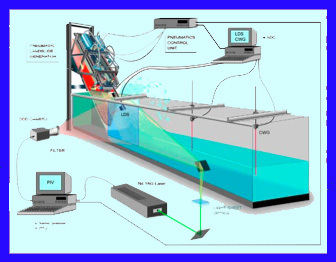 The PC model hypothesis was further verified and validated with physical modeling experiments (using a scaled rectangular prismatic water wave channel model) conducted by scientists at the Swiss Federal Institute of Technology (ETH) in Switzerland (Fritz et al., 2001). Necessary focus of future research in understanding mega-tsunamis in enclosed bodies of water, such as Lituya Bay, should be directed towards the examination and modeling of the elements relative to the earthquake energy release, the empirical analysis of earthquake source and seismic energy propagation processes, the near-field ground motions from finite fault sources of past mega-thrust earthquake events, and the systematic studies of resulting secondary effects. Because of the similarity of mega-tsunami wave generation to that from asteroid impact, it was believed that full Navier-Stokes modeling of this impulsive rockfall mechanism could be useful in the validation of the asteroid model, since no similar data existed for asteroid impacts on the ocean. Also, based on the fact that there was measurable model input parameters from the physical surveys and considerable output derived from subsequent mathematical modeling and analysis of the Lituya Bay event, the author suggested that the Lituya Bay event be used to calibrate, verify and validate theoretical modeling studies of asteroid tsunami generation conducted at that time at the Los Alamos National Laboratory (Pararas-Carayannis, 1999). This proposal was based on the following justification. Wave generation based on simulating the time history, large energy content, and other input parameters of the Lituya Bay rockfall, corrected for scale factors of volume, trajectory path, terminal impact velocity, water depth and energy imparted to the water body, could provide meaningful initial conditions to determine and separate the nonlinear portion from the mathematical solutions which use the Navier-Stokes equations to describe the gravity wave portion of an asteroid-generated tsunami - at least in its propagative phase, following impact, as it travels in the ocean. Additionally, since the incompressible Navier-Stokes equations are used to describe tsunami propagation in deep water following the impact of an asteroid on the ocean, and since these equations have limited direct application in shallow water and no application at all when turbulent, chaotic processes are encountered, the Lituya Bay rockfall and its subsequent wave generation could be used to further refine, calibrate and validate a model where turbulent flow and friction are significant factors in determining the extent of inundation. For example, based on the measured parameters of inundation, speed, and water particle velocities of the giant 1958 Lituya Bay waves, coefficients of friction can be derived empirically. These coefficients can be used to estimate more realistically wave attenuation over a land mass, of an asteroid-generated tsunami as it travels chaotically past the sea-land boundary. The author suggested that with proper scale corrections, analogies could be drawn between the impulsive impact of the Lituya Bay rockfall to asteroid impact on ocean floor sediments and on such impulsive wave generation. 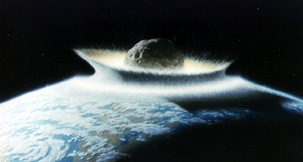 Although, the trajectory angle, terminal velocity and total mass and density of material of an asteroid would be significantly different than those of the Lituya Bay rockfall, it was suggested that these could be scaled and adjusted for the purpose of validating a model of asteroid impact. For example, an asteroid would be expected to approach the earth at a much lower angle of perhaps only 15 degrees from horizontal and would impact the ocean with a terminal speed which could be 20 km/second or more. Although there would be of differences in mass, trajectory angle, and speed at impact, the effects on the ocean floor could be markedly different, but these too could be scaled. For example, even a small asteroid of perhaps the same dimensions and mass would be expected to disturb the ocean sediments to a far greater extent than the gravity-driven rockfall of Lituya Bay. A small asteroid of only 1/3 mile in diameter falling in the ocean at 20 km /second at a low angle of entry, would be expected to carve a path of at least twelve miles on the ocean floor and to create a much larger cavity which would be cylindrical rather than radial, as in Lituya Bay. Horizontal and vertical accelerations of seismic waves from asteroid impact would be expected to be much greater. However, because of the lower trajectory angle of entry, wave generation and splashing action to a nearby shoreline may or may not be as great as that caused by the Lituya Bay rockfall. Also, it was possible that an asteroid's impact on a hard basalt ocean bottom with a thin layer of sediment would not not cause the same effect as the Lituya rockfall on softer and thicker sediment layers. Yet, in spite of potential differences, such analogies could be drawn. Known input and wave runup output parameters of the rockfall could be used, first to calibrate the Lituya Bay model (which was subsequently done), then to validate the asteroid model. 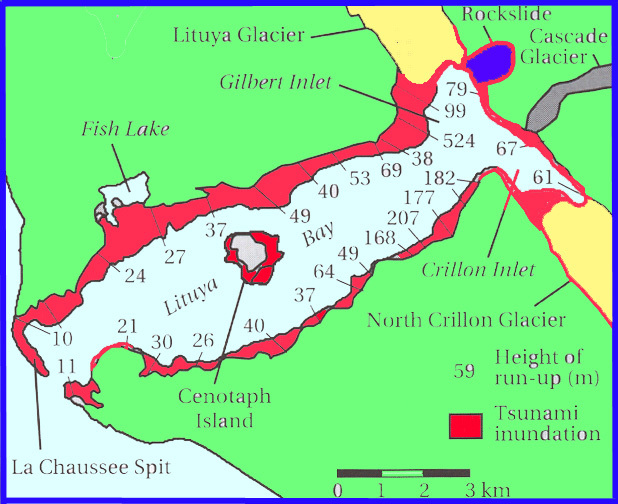 The giant wave runup of 1,720 feet (524 m.) at the head of the Bay and the subsequent huge wave along the main body of Lituya Bay which occurred on July 9, 1958, were caused primarily by an enormous subaerial rockfall into Gilbert Inlet at the head of Lituya Bay, triggered by dynamic earthquake ground motions along the Fairweather Fault. Extent and height of inundation by the giant wave generated in Lituya Bay on July 9, 1958 (modified graphic based on Miller's 1958 Survey and Captain Roberts' photogrammetry. The giant wave washed out trees to a maximum elevation of 1,720 feet (524 meters) at the entrance of Gilbert Inlet. Much of the rest of the shoreline of the Bay was denuded by the tsunami from 30 up to 200 meters in altitude. This was the most likely scenario of the event - the" PC model" that was adopted for subsequent mathematical modeling studies with source dimensions and parameters provided as input. Subsequent mathematical modeling at the Los Alamos National Laboratory (Mader, 1999, Mader & Gittings, 2002) supported the proposed mechanism - as there was indeed sufficient volume of water and an adequately deep layer of sediments in the Lituya Bay inlet to account for the giant wave runup and the subsequent inundation. The modeling reproduced the documented physical observations of runup. Also, because of the similarity to asteroid-generated tsunami waves, it was suggested that the measurable output parameters derived from the mathematical modeling and analysis of the Lituya Bay event, adjusted for scale, could be applied to the calibration, verification and validation of asteroid models of tsunami generation (Pararas-Carayannis, 1999). It was further suggested, that based on the measured parameters of inundation, speed, and water particle velocities of the giant 1958 Lituya Bay waves, coefficients of friction could be derived empirically which could be used to estimate more realistically attenuation over a land mass, of an asteroid-generated tsunami as it travels chaotically past the sea-land boundary. At the drop of a hat, without notice, people from all over jump in planes, cars and boats to answer to the call of those in need. In doing so, they are not often able to answer your calls. A live answering service can help in times of need to answer calls when trying to keep in touch. Brazee & Cloud, 1960, "U.S. Earthquakes 1958", U.S. Dept. of Com. Coast & Geodetic Survey 76 pp. Fritz, Hermann M., Hager, Willi H., and Hans-Erwin Minor, 2001 “Lituya Bay Case: Rockslide Impact and Wave Runup”, Science of Tsunami Hazards, Volume 19, Number 1, pages 3-22 (2001). Jarstad, F. (1968). Waves generated by landslides in Norwegian fjords and lakes. Norwegian Geotechnical Institute Publication 79: 13-32. Norwegian Geotechnical Institute, Oslo. Kamphuis, J.W., Bowering, R.J. (1970). Impulse waves generated by landslides. Proc. 12th Coastal Engineering Conference, ASCE 1575-588. Law, L., Brebner, A. (1968). On water waves generated by landslides. 3”1 Austrulas. Conf. on Hydraulics and Fluid Mechanics, Sydney, Paper 2561: 155- 159. Mader, Charles L., 1999, “Modeling the 1958 Lituya Bay Mega-Tsunami”, Science of Tsunami Hazards, Volume 17, Number 1, pages 57-67.(1999). Miller, L. (1964). The rock slide in the Vajont Valley. Rock Mech. Eng. GeoZ. 2(3-4): 148-212. Pararas-Carayannis, G. (1999). Analysis of mechanism of tsunami generation in Lituya Bay. Science of Tsunami Hazards 17(3): 193-206. Prins, J.E., 1958a, "Characteristics of waves generated by a local disturbance", Am. Geophys. Union Trans., v. 39, p. 865-874. Prins, J.E. 1958b, " Water waves due to a local disturbance", Proc. 6th Conf,. Coastal Engineering, Council Wave Research, Eng. Found., Berkeley,Calif., p. 147-162. Tocher, Don, and Miller, D.J, 1959, "Field observations on effects of Alaska earthquake of 10 July, 1958", Science, v. 129, no. 3346, p. 394-395. U.S. Coast and Geodetic Survey, 1942, Chart 8505, Lituya Bay. U.S. Coast and Geodetic Survey, 1957, "Tide Tables, West coast of North and South America", 1958, p.120, 182.